Good: Great mix of veteran and rookie cards, lots of parallels at different price levels, booklet cards, fantastic patches and logo cards. Bad: Just four cards per box, potential for below-average hits, sticker autographs, redemptions. The Bottom Line: A lot of anticipation comes with busting 2011 Topps Supreme Football. It, however, has the potential to be just as big a letdown as it does of having a great pull. Collectors who know this going in should be willing to take the risk. I like the design of the cards. It appears to be a cross of 2011 Topps Inception and last year's 2010 Topps Supreme. The action photos of rookies in their pro uniforms are a definite draw. The huge patch windows for memorabilia cards are great for display and offer fantastic eye appeal. The 100-card base set mixes rookies, veterans and retired stars. It has all the players collectors expect like Peyton Manning, Drew Brees and Ray Lewis. 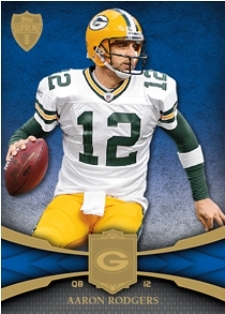 Also, Aaron Rodgers makes a long overdue appearance in newer products.The autograph checklist has lots of current and retired players. There are also more than 30 different autographed rookie cards. The 2011 rookie class is also featured prominently in the Red Zone Rookie Autographs, which are included as bonus hits and don't count toward regular insertion rates. Multi-autograph and book cards offer the potential big hits. Each box has one pack of four cards: two base cards, one Red parallel and one autograph, autographed relic or relic card. Our hit was a redemption. When you're spending upwards of $100 for a pack with one hit and it's a redemption, that's hard to excuse. Although many collectors are bound to find big hits, others are going to be left feeling cold. It's exciting anytime you bust a box that has the opportunity of landing a mega-hit. That said, with just four cards, that feeling disappears quickly. And while getting a redemption as the lone hit is disappointing, I look forward to eventually receiving what should be an extremely nice card. Is it worth the hefty price tag? Definitely, for those who can afford the risk. 2011 Topps Supreme MARK INGRAM DUAL JERSEY AUTO AUTOGRAPH RC SP #15 15 SAINTS!! 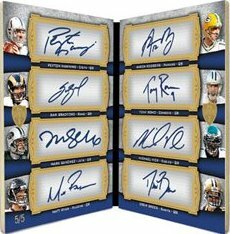 2011 Topps Supreme Football takes the high-end concept of autographs, memorabilia and patch cards and comes at it directly. Boasting an autograph and either a relic or autographed relic in every pack, it cuts directly to the chase. Each case provides a balanced mix of autographs and premium memorabilia cards to make sure the release has good balance and value. Collectors can also look forward to plenty of patch parallels, multi-signature cards and loaded book cards. 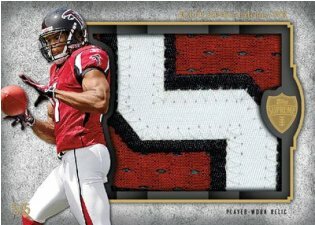 Check out some of the top 2011 Topps Supreme Football cards with out hit tracker. 100-card base set featuring rookies, veterans and retired stars. Base set parallels: Red (/99), Violet (/75), Sepia (/50), Green (/15), Framed Printing Plates, Platinum (/1). 16-box cases promise a breakdown of four autographed relic cards, four autographed rookie cards, one single autograph, one multi-signature card, one additional autograph card and five relic cards. The single Autograph Cards checklist will have up to 20 current and retired players. Parallels: Red (/25), Green (/10), Framed Printing Plates, Platinum (/1). Autographed Rookie Cards of up to 35 members of the 2011 rookie class. Parallels: Red (/50), Violet (/25), Green (/15), Framed Printing Plates, Platinum (/1). Red Zone Rookie Autographs (/5) feature on-card signatures from the 40 NFL Rookie Premiere participants. Red Zone Rookie Autographs are included as bonus hits and don't count toward regular insertion ratios. Dual Autograph Relic Cards (/5). Dual Autograph Patch Cards (/1). Triple Autographs (up to 15 cards, /10). Quad Autographs (up to ten cards, /5). Six Autograph Double-Sided Cards (up to three cards, /5). Eight Autograph Book Cards (up to three cards, /5). Basic Autographed Relics (/50). Parallels: Red (/20), Platinum Patch (/5). Dual Autographed Relics (/15). Parallels: Red (/10), Platinum Patch (/5). Autographed Quad Relics (/10). Parallel: Platinum Patch (/5). Autographed Jumbo Patch Relics (/10). Parallel: Platinum Patch (/5). Autographed Double Jumbo Patch Relic Book Cards (/10). Parallel: Platinum Patch (/1). Autographed Six-Piece Relic Book Cards (/10). Parallel: Platinum Patch (/1). Rookie Quad Relic Cards (up to 40 cards, /25). Parallels:Red (/10), Platinum Patch (/5). Rookie Quad Combo Relic Cards (up to 45 cards, /25). Parallels: Red (/10), Platinum Patch (/5). Supreme Rookie Die Cut Relic Cards (up to 35 cards, /55). Parallel: Platinum Patch (/5). Jumbo Supreme Patch Cards (up to 30 cards, /5). Letter Patch Cards (up to 100 cards, /1). Primary Piece Relic Cards (up to 100 cards, /1). Six Piece Double-Sided Relic Cards (up to 20 cards, /20). Parallel: Platinum Patch (/1). Eight Piece Relic Book Cards (up to 15 cards, /20). Parallel: Platinum Patch (/1). Veteran Quad Relic Cards (up to 30 cards, /20). Parallel: Platinum Patch (/1). Hall of Fame Cut Signature Cards (25 cards, /1). List of Tim Tebow cards available in 2011 Topps Supreme.